RideFATbikes.ca is now a full-suspension MTB dealer and custom builder for FOES RACING, KNOLLY, and BH Bikes. Stay tuned for more MTB brands joining soon! We are an authorized Canadian dealer for ATOMIK, DERBY, NOBL, FATBACK/KNIGHT COMPOSITES and ENVE custom carbon wheelsets. RIDEFATBIKES.ca is a Gold-Level Dealer for FATBACK bikes. The 2019 FATBACK CORVUS has been released and we have them in stock, and available for demo rides. Frame updates include internal dropper post routing, better single-speed capability, and a striking new colour-way design. Our 2018 FAT BIKE SUSPENSION FORK SHOOTOUT for both SUMMER and WINTER testing has now passed 16k reader views. We are the exclusive FOES RACING reseller for Ontario, and a leading FOES MUTZ custom builder in Canada. RideFATbikes.ca is now an authorized dealer for MAGURA braking systems. New “Big Su” Alloy and Fatback / Knight Composites “Wide Ride” Carbon wheelsets, laced up with the latest Fatback Alaska Edition or DT Swiss 350 hubs. Extremely lightweight (1950gr) and 4-season trail rated. The new lightweight, low-Q factor GX Alloy, and XO Stylo carbon SRAM DUB 12spd drivetrains. Premium Front Suspension options, utilizing the Mastodon PRO 100 EXT and 120 STD forks. Improved Braking systems, including the SRAM Guide RSC and CODE RSC brakesets with SRAM Centerline 180/160 rotors. Plus many other nice component enhancements - making even lighter, faster, and better handling fat bikes than last year. RideFATbikes.ca is offering many exclusive * FREE * upgrades to the stock 2019 FATBACK build packages, including premium suspension, carbon fork, second set of tires, airline travel cases, and other expensive upgrades at no charge. Premium free upgrades are posted below, and in our BUILD KIT sections for the RHINO FLT, CORVUS, CORVUS FLT, SKOOKUM / FLT. We now offer nationwide, overnight express shipping, to all major Canadian airports serviced by CARGOJET. To qualify for this overnight express service, you must purchase the Fat-bike specific EVOC BIKE TRAVEL BAG XL airline transport case, at time of order. Why do we offer this service? Your custom built bike will arrive within 12 hrs, in a well-protected travel case, and will bypass the potential time delays and shipping damage of long-distance ground transport. Note : Some component and accessory items only available with the purchase of a complete bike or frameset. RideFATbikes.ca will match all Manufacturer Authorized Retail and MAP pricing for the products we carry. 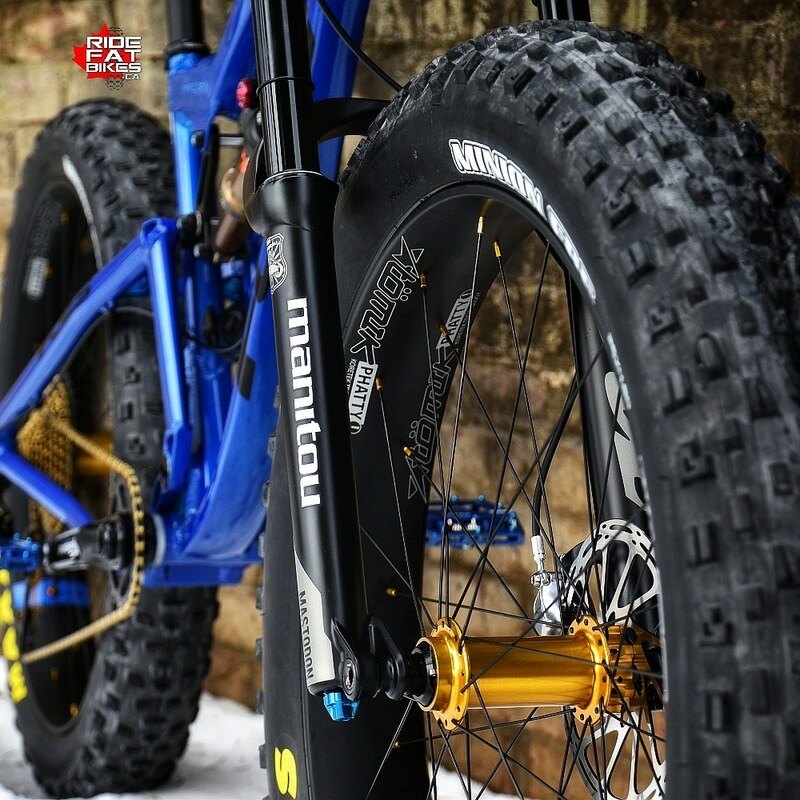 Ready for a QUALITY FAT BIKE in your Life ..? All original landscape photography, digital artwork, and photos of our custom built bikes are intellectual property of RideFATbikes.ca. RideFATbikes.ca content videos used with permission courtesy of Fatback Bikes / First Tracks Productions, and 10-time NATC Trials Champion, FATBACK Ambassador - Pat Smage. All stock media photos are used with permission from our Industry Partners.